The Boy Scouts of America will introduce the new merit badge at the SXSW Gaming Expo being held this weekend. I was a Cub Scout for a few years, before my innate dislike of all things organized got the better of me, and during that time I earned approximately two merit badges, both of which I suspect were awarded out of pity. Back then, it was all about tying knots and doing your civic duty and trying to figure out which mushrooms were least likely to kill you, all of which my interest in and aptitude for added up to approximately zip. But things have changed since those days long ago, and I'm not just talking about the advent of electricity and indoor plumbing; I'm talking about something that might actually be relevant to today's more indoorsy kind of kid. The Boy Scouts of America unveiled the Game Design merit badge today, which will encourage scouts to look at games in a different light - and not just videogames, but boardgames, sports and other forms of play. But Scouts won't earn the badge just for having thumbs of fire and steel; they must "analyze different types of games; describe play value, content, and theme; and understand the significance of intellectual property as it relates to the game industry." The requirements for the merit badge were developed over a two-year period by volunteer gaming enthusiasts and representatives from the game industry (which one wasn't specified). Scouts vying for the badge will also have to design a game, using a design notebook that demonstrates the initial concept, multiple iterations based on testing and feedback from blind tests. 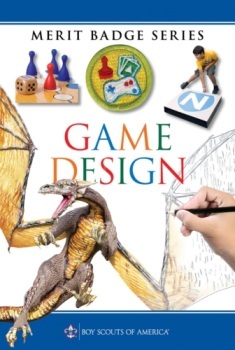 Game designs can be for board or card games, dice or even smartphone apps, and where applicable, prototypes can be tested at Scout camps or other functions. The badge will be unveiled to the world at the SXSW Gaming Expo in Austin, Texas, which runs from March 8-10.